LOCAL authorities were accused of making money by selling the electoral register this week. I’m not sure they have a choice over whether they can say yes or no if somebody asks to buy it and whether the obligation is actually to make it available regardless. 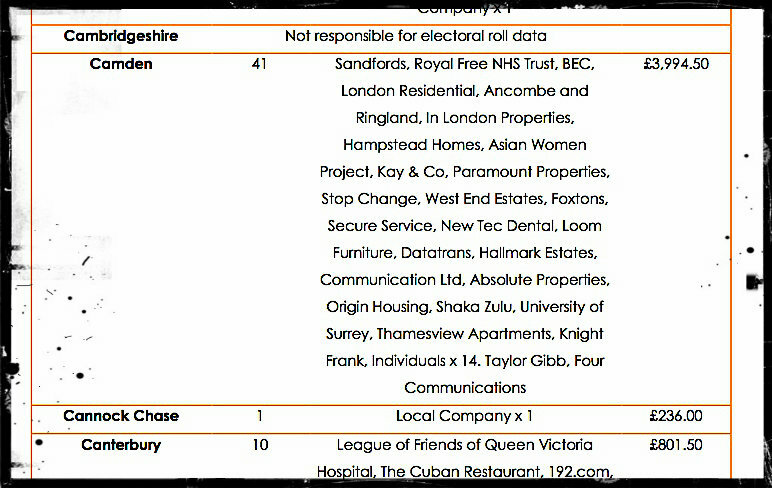 From the Big Brother Watch pressure group’s FoI work, the root of the stories this week, however, you can see who Camden Council has sold the details to, which is interesting in itself. They include a host of estate agents and Camden Town’s Shaka Zulu nightclub. Forty-one sales for just under four grand. The complaint is that the information is often used by those who buy it for cold-calling marketing and unwanted mail shoots. Makes for a good anti-Town Hall splash in the usual right-wing press columns, but as Big Brother Watch knows we are forced to do this: all local authorities (Camden is not an exception) have what now seems to be a rather archaic legal obligation under the Representation of the People Regulations 2001 to provide an edited version of the electoral register to anyone who pays the appropriate administration fee. Residents who do not want their details included on this publicly available version of the electoral roll can opt out, either by ticking the box on the voter registration form or by signing a section 11 Data Protection Act notice, which can be downloaded from the Camden Council website or here http://www.stopjunkmail.org.uk/guide/edited_electoral_register.php This will permanently remove details from the edited version of the electoral register. “Not a lot of people know that” Next time you send out the the forms how about highlighting the fact in colour, even red would be good! Do any Camden libraries have it? But you are not excluded from the edition supplied to political parties!